Congratulations to all the contestants in last Friday's Fall Warbler ID Quiz. 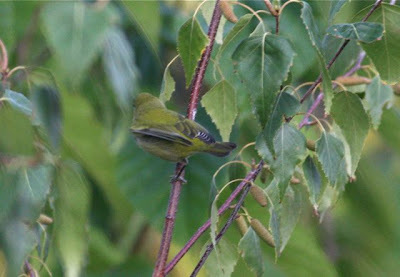 Alan Pulley, who blogs at this location, was the first reader to correctly name this mystery bird as a Tennessee warbler. Nice detective work, Alan! My silence over the weekend was not due to my disapproval of the various guesses on the mystery bird's ID. Rather, I was blissfully out of touch with the Web while performing at The Berkeley Spring (WV) Fall Birding Festival. While there I got to see some old birding pals, make some new ones, and had the amazing experience of seeing nearly 1,000 migrant blue jays streaming overhead in groups of 6 to 40 during our Sunday morning bird walk at Sleepy Creek Retreat. No life birds, but a life birding experience seeing so many blue jays in the space of a couple of hours. The hurricane rains did nothing to dampen our spirits. Now back to our mystery bird. I did not use an image that showed the bird's face and head. Seeing the faint crowned appearance, the pale supercilium (line over the eye), and the very thin bill would have been really easy clues to the bird's identity. The best initial step to take when trying to identify a drab fall warbler is to ask yourself: "Does it have wingbars?" If it does, you've already narrowed your potential species options to those WITH wingbars. Next, check to see if the underparts are streaked. This narrows your choices even further. (For a great synopsis of this process, get yourself a copy of Identify Yourself: The 50 Most Common Birding Identification Challenges. Eirik A.T. Blom, Julie Zickefoose, and I each wrote chapters covering the warblers in ways that we find helpful and memorable. Bird ID experts Jeffrey A. Gordon, Marshall Iliff, and George Armistead also share their knowledge in the book, which was published by Houghton Mifflin in 2005). So what DID my mystery warbler photo show? It showed a bird with a uniformly greenish back and rump, with no obvious wingbars or tail spots. It appears to be only slightly lighter-colored below, with no obvious streaking on the underparts. This eliminates chestnut-sided warbler which would appear paler/grayish-white below and which would show obvious wingbars. Pine warbler would show obvious wingbars, too and would be streaky below. A Cape May warbler would have a duller-gray back, but a lime-green rump. This bird's back and rump are the same color. Having grown up as a bird watcher in the East and Midwest, I am much more familiar with the Tennessee warbler than I am with the orange-crowned warbler. Every fall I see dozens and dozens of TNs on my farm. In 16 years there, I've seen exactly one orange-crowned. Bathing Tennessee warbler. Photo by Julie Zickefoose. 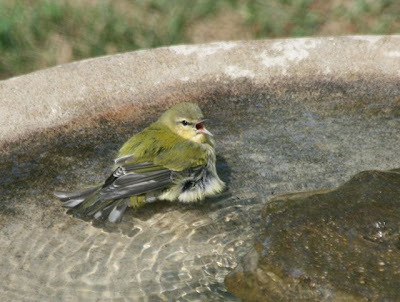 Here is a fall Tennessee warbler bathing in our Bird Spa. Note the supercilium, the finely tipped bill, and the greenish back. Sorry for the headless bird ID quiz photo. In the next one, I promise to show the head and face. Thanks for your mention of the hard ID book. I'm eager to add it to my field guides. I enjoyed the warblers migrating through my yard last spring. Actually, even though I whined about it, headless bird photos are a good way to practice mystery bird ID's, since in the real world, birds have a disturbing habit of NOT posing in perfect profile. So, keep on showing the "bad" photos, since that tends to be what I see in the field. Oh, and BTW - I didn't realize Orange-crowneds were so uncommon in SE Ohio. I have never seen one, but it seems like everybody else in SW Ohio is shooing them away with flyswatters. Thanks Bill. These quizzes provide a fun way to learn about bird identification. I hope you continue them! I purchased a copy of "Identify Yourself: The 50 Most Common Birding Identification Challenges" a few months back and have found it to be an extremely useful birding tool - thanks again! Thanks for your warbler lesson, Bill. I've seen one of the warblers you mentioned - Pine Warbler. As for the rest, I just sit here and enjoy the show.